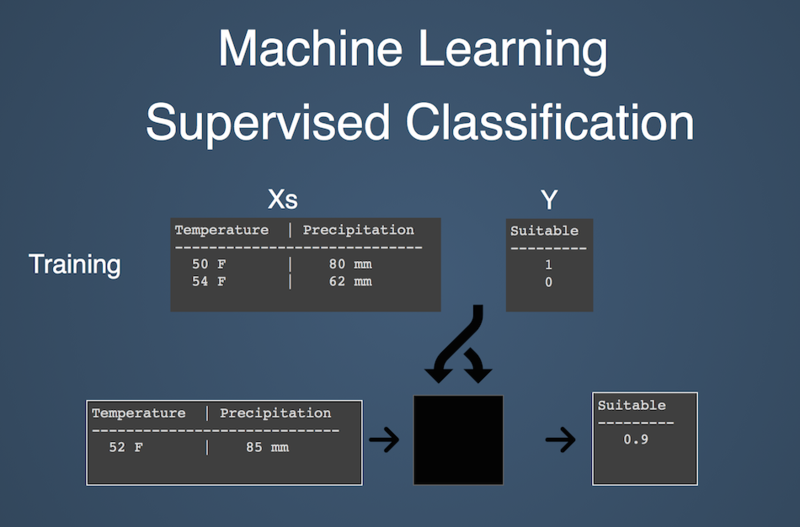 pyimpute provides high-level python functions for bridging the gap between spatial data formats and machine learning software to facilitate supervised classification and regression on geospatial data. This allows you to create landscape-scale predictions based on sparse observations. The target data consists of explanatory variables represented by raster datasets. There are no response variables available for the target data; the goal is to predict a raster surface of responses. The responses can either be discrete (classification) or continuous (regression). evaluate_clf: Performs cross-validation and prints metrics to help tune your scikit-learn classifiers. Here's what a pyimpute workflow might look like. In this example, we have two explanatory variables as rasters (temperature and precipitation) and a geojson with point observations of habitat suitability for a plant species. Our goal is to predict habitat suitability across the entire region based only on the explanatory variables. See the .travis.yml file for a working example on Ubuntu systems.